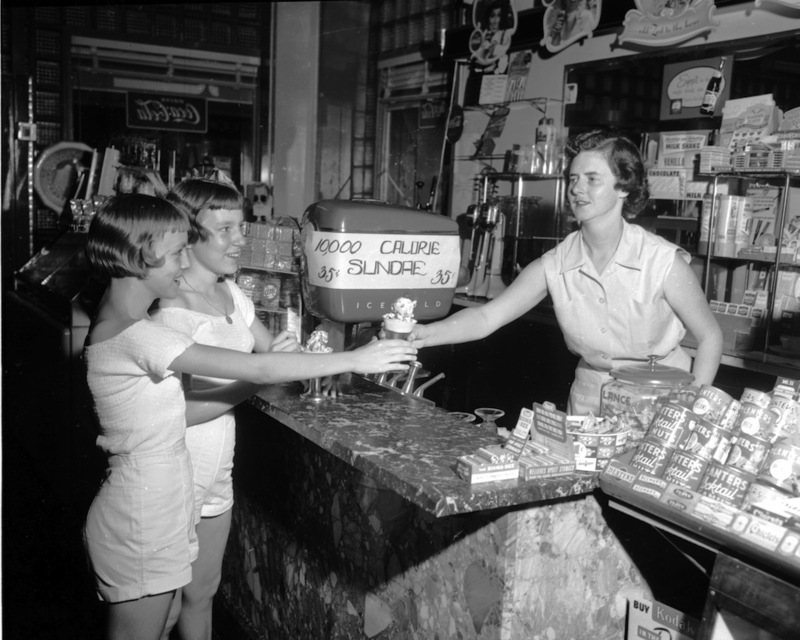 The image above shows two young girls purchasing a so-called “10,000-calorie sundae” from Blair Parson’s store in Lynchburg, Virginia, sometime in the 1950s. Price: 35¢. Odds are that this was some marketing license; the average hot fudge sundae comes in at about 284 calories, and these don’t look like killers. But it’s a cute picture. This entry was posted in Ice Cream, Photos and tagged history, Marketing. Bookmark the permalink. There is a guy at the northern end of the Appalachian Trail in Maine who has an ice cream shop and who may well sell a 10,000 ice cream monster. I met him in Northern Georgia near Springer Mountain and he invited my buddy and I to indulge if we made it up there. We never did but I’ll not forget it. Sounds delightfully insane. Perhaps a football team could manage it?